Wholesale Custom Condom Matchbooks, Personalized in Bulk. Inexpensive, Budget Prices in USA and Canada. FDA approved. 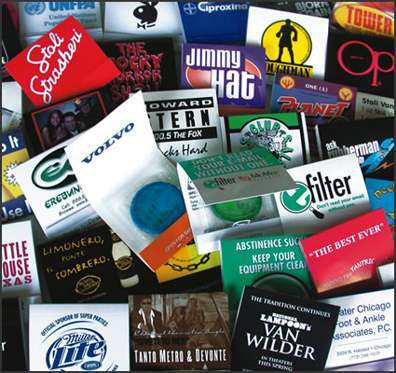 Bulk Personalized Condoms Matchbooks, custom imprinted with your logo or message. We also supply blank (not imprinted) bulk customized condom matchbooks: contact us for pricing. Lowest prices in USA, Canada for customized condoms in bulk. Free artwork design. American clients pay no taxes, Canadian clients don't pay PST. We will send you a proof for your approval before production. It looks like a book of matches, but above the striking pad is printed "Open for Safety" in place of the usual "Close for Safety" message. This discreet condom package offers a large imprint area, holds one condom and includes FDA recommended instructions. Front Imprint: 2.5" X 2.25"
Back Imprint: 2.5" X 2.5"
Production: 15-20 days after artwork approval ; Rush 7 day production is available: add 20% to unit price.